Good ideas on how to do certain operations in engine building that may not be obvious in the beginning from a master engine builder. Very few engine construction plans and drawings specify the order of production of engine parts. The builder is expected to produce the parts in a logical order that allows fitting the part under construction to existing parts. The FIT is more important than the exact dimension. Too many builders assume they can build parts in ANY order as long as they are produced exactly to the dimensions shown. The TIP here is to build the connecting rod LAST, as this is the final opportunity to EASILY set the desired compression ratio by varying the rod length. An excellent choice for head gasket materiel is virgin Teflon. A thickness of .032" is also a good choice as the thickness can easily be changed, at a later time, to change compression ratio. It is not likely that a Teflon gasket will "blow", it will not stick to the head or block at high temperatures and needs no sealing compound. It is a pleasure to lift the head off the engine, after years of running, and not encounter the mess left by Asbestos and paper gaskets. Sheet Teflon is readily available at a reasonable price. Avoid Teflon that has been etched on one or both sides. Teflon is easy to cut if you use Brass tubes, sharpened at an angle from the inside, much like a core drill. The correct OD Brass tube will slip inside the head bolt holes to cut the gasket. The larger cylinder holes can easily be cut with precision if you take a minute to turn out a cylinder with a 1/2" spigot. Sharpen the business end of the cylinder with an internal angle to form a sharp edge at the OD. Clamp the Teflon sheet, on a wood block, on the mill table and cut the first hole. Move the table the required distance (cylinder spacing) and cut the next hole. Often builders are required to drill a cross hole in a round, square or hex rod to accommodate a pin or bolt. Some just "eyeball" it, and hope for the best. Others use an Edge Finder, and hope for the best. Still others mill a small flat spot, and hope for the best. Here is a quick, easy procedure I use that gives good results. Clamp a block of metal, with one reasonably flat side against the stationary jaw of the mill vise. Drill a hole the size of the rod to be drilled. Without moving anything else, loosen the vise and rotate the block 90 degrees. Tighten the vise, insert the rod to be drilled and drill the cross hole through the block and the rod. Both holes have the same center and the block acts as a drill guide. Drill the opposite end of the rod for a spare. If you have a drill large enough, or a boring head. the wrist pin hole in pistons can accurately be drilled and reamed with this procedure. A little extra time will prevent ruining a piston. Here is a quick, easy addition to your shop that will save money and time. You will need a small plastic spray bottle, the type used to spray eye glass cleaner. Empty bottles, in various sizes can usually be purchased from Kmart or Wal-Mart. You will also need the red plastic tube usually taped to the side of spray cans such as WD-40. Pull the spray head off the bottle and drill the spray hole the same size, or slightly smaller, than the OD of the red tube. Heat the center of the red tube with a small flame until almost melted. Quickly stretch the tube to draw the center down to a very small diameter. Cut the tube in the center to form two tubes with tapered nozzles. Trim the end of the nozzle to the desired ID. An ID as small as .002" is easy to obtain. The nozzle will reach deep into very small holes to administer only one small drop of tapping fluid, WD-40, oil, amalgamated moose juice, etc.. I have several of these bottles and constantly use them to lubricate drills, taps, saws, and cut off blades. Often builders are required to fabricate a check valve for use in fuel lines. 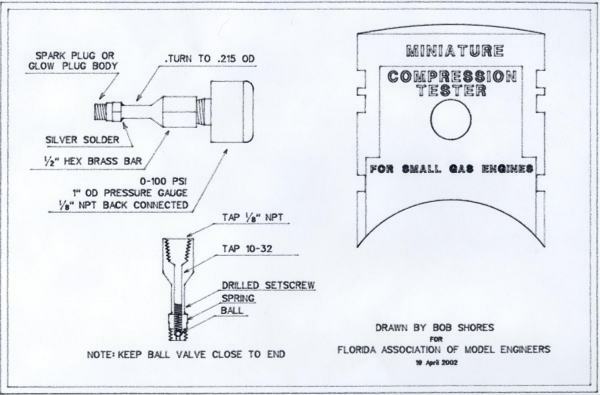 The valve has a small "inlet" hole, a larger "chamber" hole that retains the ball and an "outlet" hole. Usually no data is given and the builder must use his own judgment about sizes. 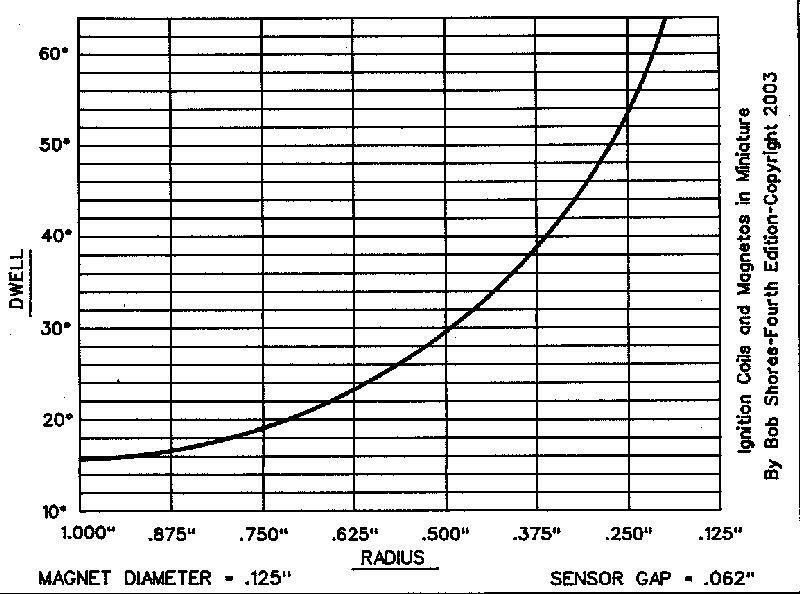 Here is the data I use for check valves. The inlet hole is 75% of ball diameter. The chamber hole is 135% of ball diameter. The outlet hole is usually .125" for 1/8" OD brass tubing. A tab can be formed in the end of the tube and bent over to act as a ball stop. If the inlet hole is too small, engine vibration will dislodge the ball. If too large, the ball will stick. I am sure there are other combinations, but this one is easy for me to remember. Much has been written about producing pistons and rings. I have tried every method I am aware of. One thing I have learned is that when someone starts to tell me how to make piston rings, I stop him and ask him to crank up his multi cylinder engine. If there is smoke in the exhaust, I ask why he did not make a good set of rings for his own engine. Over the past many years of reading and patently listening to men explain how they make pistons and rings, I have slowly developed a procedure that consistently produces pistons and rings that fit and work well ,,, for me. For lack of a better tag, I call it the Shores Procedure. Here is my procedure to produce Cast Iron pistons, rings and cylinder liners. Close grained, centrifugally cast, Cast Iron is my choice for these items. Good engineering rejects all other metals with the exception of Aluminum for the piston. First, fabricate the cylinder liner by boring it to ID minus .003". Install the liner in the block. Do not use a hone as this will only increase eccentricity and taper. Lap the liner with an expandable Aluminum lap. The length of the lap should be 3/4 of the liner length. Use Clover Leaf fine grinding compound, available at most Auto Parts stores. Do not put Diamond dust in your engine. Diamonds are forever. The particles in the grinding compound are manufactured to crack apart in use, leaving sharp edges, thus the compound will diminish in size and fresh compound will need to be added during the lapping process. Lap to a mirror finish. Do not leave herringbone scratches to retain oil for the piston. Rarely does a piston lack oil, the PROBLEM is to prevent oil migration from the oil pan, around the piston and into the combustion chamber. To produce the piston and rings, chuck a short length of Cast Iron and turn a 3/8" OD spigot about 3/4" long. The spigot will serve as a "handle" to hold the work. Chuck by the spigot and turn to piston OD plus .003". Cut the ring grooves .003" deeper than specified. Drill and bore the ID, leaving the skirt long enough to part off 2 or 3 rings later. Grip the spigot, horizontally in the mill vise. Drill and ream the wrist pin hole. Grip the spigot vertically in the mill vise. Insert a temporary rod through the wrist pin hole to align the piston. Mill the slot for the rod. Chuck the spigot in a 3/8" VSR hand drill and lap the piston with a compressible Aluminum lap to be a snug fit in the cylinder, certainly not loose, but not overly tight. Remember that from this point on, the piston will only get smaller. Back in the lathe, part off the rings. Before you completely part a ring off, lay a fine file over the groove and remove any burr raised by the cut off tool. Stroke both sides of the ring on 600 grit paper on a flat surface. Wrap this paper around a rod and de-burr the ID. Be sure the rings fit the groove in the piston. Part off the piston. Grip most of the ring in the mill vise. Pad both sides with thin soft wood and do not over tighten. Use a circular saw blade, about .006" to saw the ring into. At this point, you are assured that the ring is a perfectly circular and that it fits the piston and cylinder liner. The ring needs to be "sprung" open so that it exerts a slight pressure against the cylinder liner walls. To spring the ring, the circularity must be altered, certainly not anywhere near the gap but at it's natural flexure point, which is directly opposite the gap. To do this, lay the ring on a flat, powerful magnet. Place a square steel bar in the gap. Arrange the ring so that the area opposite the gap is off the magnet. The magnet will securely hold the ring and bar and also act as a heat sink. Use a small Butane torch to heat the area directly opposite the gap to a dull red color. The Shores method prevents the use of special fixtures, an oven to heat the ring to high temperature that certainly distorts, warps and scales the ring. Also, the ring is gapped without manual breaking or chopping it into with a cold chisel and the working surface of the ring is free of tool and file marks. Certainly there are other methods and the prudent builder will use the one he is comfortable with, without knocking his buddies method. Occasionally, ones curiosity can be satisfied by actually measuring the compression of a small gas engine. Especially on multi-cylinder engines where it is difficult to determine which cylinder is not "up to snuff". If you enjoy building small tools, here is a nice project for your tool box. I found a small pressure gauge in my junk box, the type used on small steam engines and boilers, and decided to build a compression tester shown in the accompanying photo. The drawing that also accompanies this TIP is self explanatory. A 1/2" hex brass bar is gripped in the lathe 3 jaw, drilled and tapped 1/8 NPT to accept the back connected, 1" OD, 100 PSI pressure gauge. The bar is then drilled deeper and tapped 10-32. A smaller drill is used to drill through. Gut an old 1/4-32 sparkplug or glow plug. Turn the stem of the tester down so that the end slips in the sparkplug body. Silver solder the plug to the stem. The ball check should be close to the end of the plug body to prevent enlarging the combustion chamber during test. Drop a steel ball inside, then a weak spring. Anneal a 10-32 setscrew, drill a small hole through it and install the setscrew to place a little tension on the ball. Install the gauge with some pipe dope on the threads and you are in business. A drop of oil on the ball will usually seal a very small leak. Some builders may note that air can be trapped between the ball check and the gauge. Not to worry. My ex-friend Pete, while sitting in his bathroom, had a stroke of genius. Pete suggest that after the test is made, the ball is momentarily moved off it's seat and the gauge will automatically go to zero. Pete also suggest that you use the plastic tip of your shoelace to do this. Click here for a larger drawing that may be printed. I receive many questions about small valves (Valvets) so maybe this TIP will be of some value to novice builders. Right or wrong, this is how I do it to get the results I desire. upon. Also have a completely machined valve guide on hand to check the fit of the valve stem. I always choose Drill Rod for valves and I do not harden it. In the 3 jaw, chuck the rod close, face and center drill with a No.2 center drill. Extend the rod about 3" from the chuck and bring up the tailstock center to steady. Keep the center oiled and clean as the smallest chip that gets in the center hole will throw the work off quite a bit. To prevent damage due to heat, Keep the center slightly loose until the finishing cuts are made. I prefer a solid center. Use a left hand round nose cutting bit, sharp and on center. Turn the rod down to the head diameter for a length of about 2" from the tailstock. Cut ONLY toward the headstock. Turn the stem to plus .002" of desired diameter and to stem length. The length is in addition to the center hole depth. Apply a drop of WD-40 to the surface when making the final cuts for a smooth finish. Cut a very shallow groove near the tailstock to identify that end of the valve and where to, later, cut the center hole away. Cut the groove, if used, for the spring retainer, with plenty of WD-40. Cut a third groove to identify the overall valve length and where the valve will later be parted off at the head. Usually, the valve stem diameter is reduced under the head so that the stem presents less obstruction to fuel flow. Turn this portion down and if the round nose bit is set at the correct angle, the bit will automatically form the taper under the head. Swing the compound around to 45 degrees and cut the valve lip to within .020" of the groove. Remove the rod from the lathe and grip the center drilled end in a vise. Cut the wine glass shaped end away, at the groove, with a high speed abrasive disk. Be very careful not to bend the stem. Face the end of the stem and grind a slight chamfer with the abrasive disk. Return the rod to the 3 jaw and lap the stem for a nice fit in the valve guide. Do not lap the valve seat at this time. Part the valve off at the groove. After installing the valve guides and drilling the tunnel to the guide, lap the valve to the guide. Do not put oil on the valve or valve guide. Place a bit of fine valve grinding compound on the valve lip, insert it in the guide. Force a short length of plastic or rubber tubing over the stem. Pull slightly on the tubing and twist the valve back and forth, with your thumb and forefinger, about 8 times. Rotate the valve 120 degrees and do the twist again. Continue the above until you feel the cutting stop. Do NOT rotate the valve continuously in one direction. Do NOT use a drill motor to turn the valve. Scrub the parts clean and test for leaks. lap the valve a second or third time to correct any leaks. This fixture saves a lot of time and insures that the valve is properly seated and leak tight before installing the head on the engine. Hit-or-miss engines have a "Atmospheric" inlet valve and the spring should be very weak as compared to the exhaust valve spring. You certainly do not want the exhaust valve to operate as an Atmospheric valve. It is commonly said that the only reason for a spring on the inlet valve is to keep bugs out of the combustion chamber when the engine is not running. and difficult starting. High compression = easy starting and fast idle. It's a compromise. 5:1 is common for hit-or miss engines. It is prudent to make several valves, to become familiar with the tools and procedures and to develop your own methods. When clamping work to the mill table or lathe faceplate, we often wonder if the work will slip or twist while machining. Take a moment to apply a few strips of masking tape, preferably 2" wide, to the mill table or faceplate. Not only will this increase rigidity, it will also provide a lot of protection for the table surface. Masking tape also works very well on vise jaws and on round stock that is gripped in the lathe chuck. If the tape is left in place for a few days, WD-40 will quickly remove it. Here is a worthwhile TIP submitted to me by a builder. I am ashamed to say that I forgot his name and lost his e-mail. If you intend to produce a piston and rings using the 'Shores Method' as described here in the TIPS section and in Home Shop Machinist, the procedure calls for a 1/2" OD spigot to handle the piston with. A neat trick is to install the piston upside down in the engine before removing the spigot. The spigot can then be used to center the crankshaft, fore and aft. If your rod bearing width is less than 1/2", machine a short step on the end of the spigot with an OD that is equal to the rod bearing width. I cant believe I forgot to post this one about fuel. About 15 years ago, I noticed that when I accidentally sprayed some WD-40 into the carburetor inlet of my Coles Small hit-or-miss engine, the RPM's during the miss period increased. Tried it again, sure made a difference. I mixed up some Coleman Lantern fuel (Triple filtered, non leaded gasoline with a rust preventative added) and WD-40. The mix was 1 part WD-40 and 19 parts Coleman Fuel (5 percent). It was more than just obvious that the friction in the engine was greatly reduced (more turns of the flywheel during the "miss" period. Being curious, I tried different mixtures, 10, 15, 20 and 25 percent WD-40. At 25 percent, the exhaust got pretty wet, otherwise no difference in performance than 5 percent. After 4 hours of running on 5 percent, I took the head off. The combustion chamber was clean as a pin. The small amount of carbon on the piston was wiped away with a soft napkin. The WD-40 suspends carbon and washes it out the exhaust!! This can be seen as small black droplets in the exhaust. I have not had the head off since that day and never had a problem with carbon buildup on the piston, valves or sparkplug. At the last Cabin Fever show, I ran the Silver Angel about 4 hours. I forgot to fill the crankcase with oil. No damage. The WD-40 gets everywhere in the engine and keeps it lubricated. I am NOT recommending you run a engine without oil, that would be lubricous. WD-40 has a slight disadvantage that a critic would be quick to point out. If the engine is left on the shelf for a few weeks, a thin film of gum is deposited, making the engine a tiny bit more difficult to start. This is really no problem as fresh fuel washes the gum away very quickly. Marvel Mystery Oil will work similar to WD-40 but, not as well. 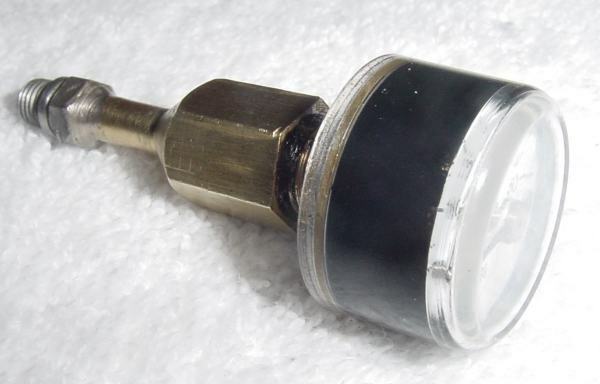 Regular motor oil mixed with the Gasoline WILL cause carbon problems and greatly increase the resistance of the sparkplug gap. I have recommended this fuel, 10 percent for break in and 5 percent after break in, for the past 14 years and, if I find a better fuel for hit-or-miss engines, I will immediately switch to it. Many years ago, I needed a flat belt to couple the hit-or-miss engine on my tractor, Old Smokey, to it's gearbox. Commercially available rubber belts, toothed belts and chains were inappropriate. I tried to make one from leather but was never satisfied with attaching the ends together with glue, stitches or staples. I finally hit upon a simple technique, made a belt and installed it on Old Smokey. That was over twelve years ago and although the belt is now black with dirt and oil, it still functions well. It recently had an 8 hour run at Cabin Fever 03. Here is the technique that I used. Select a cylinder of the proper diameter such as a coffee can, glass jar, Oatmeal box or metal disk. Apply two wraps of adhesive tape, adhesive side up. The tape can be any width you choose. Next, wind a layer of small diameter copper wire, such as No. 40., double space the wire and do not wind it on too tight. Next, apply two or three layers of adhesive tape, adhesive side down. Glue the end down with a little Super Glue. The belt can be used as is, or you can go a step further by applying a thin coating of clear Silicon window caulking compound. Smooth it on with your finger. Allow the Silicon plenty of time to cure then rough trim the edges with a sharp knife. Remove the belt and trim the edges with scissors. When I was a lad, a long tailed dog followed me home. My Dad cut off his tail, renamed him Bob and said that I could keep him. I learned a lot about Bobbing and Bobbers that day. Drill a series of holes down the center of a 1/8" X .750" X 2" steel bar. Tap the holes 1-72, 2-56, 4-40 and 6-32.. To use the Bobber, screw the bolt through the Bobber, use a nut, washers or spacer to position. Grip the Bobber in the bench vise and use a large sharp file to quickly remove the excess length. The Bobber will act as a "File Button" to ensure the end is flat and even with the Bobber. Many bolts can be quickly Bobbed to the same precise length. For extra long bolts, Grip the end of the bolt in the vise, hacksaw it away then file flat to the Bobber. The Bobber can be 1/4" thick and tapped to any thread desired. Take a few minutes to make one and you will find it a nice addition to your tool box. A picture is worth a thousand words, so I am posting this drawing taken from the 4th edition of my book. The 4th edition should be available at the end of this year. The drawing relates magnet diameter to radius and dwell. This data is for a .125" diameter Rare Earth magnet as this is the most common size used. The data is not "Laboratory Quality" but it is close enough for general use. Although the magnet can be embedded in a Cast Iron or Steel flywheel, as long as the gap is .025" or less, it is best to use a plastic disk reamed for a tight fit on the crank or camshaft. The sensor can be bonded to the engine frame with Bondo, auto body patch, but work fast as it sets quickly. I have Mike Neal's Hall system on my Little Angel with the first prototype Exciter ignition coil. This made a tremendous improvement in engine starting and running over the breaker/Modeltec setup. I hope this is useful information to you and other members. When turning work between centers, such as turning a crankshaft or camshaft, the clanging and banking noise that the lathe dog makes in the faceplate is very annoying. To reduce this noise by about 98%, I made a device that I call a Dead Dog. I chose this name as I was using a Dead Center at the time. 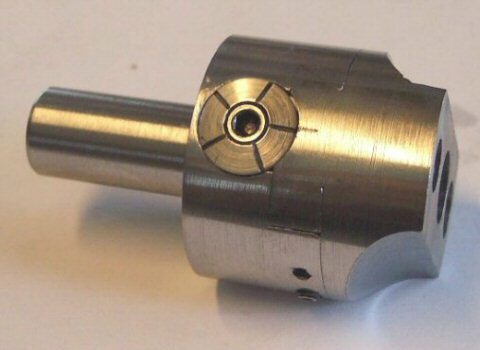 The device is a lathe dog made from two pieces of square stock with a threaded tang that sports a threaded cylinder with an OD that fits nicely into the faceplate slot. Since there is very little "slop" between the cylinder and the faceplate, the noise is gone. Commercial lathe dogs have a teardrop shaped tang, making it difficult to fit it with a "Snubber". 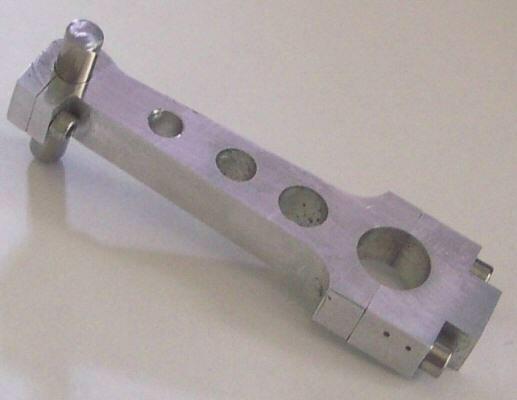 The clamp type rod offers so many advantages that I chose this design for the Pacifier V 4 engine that I am building. The small amount of time and labor to make this type of rod makes engine assembly and disassembly a more pleasant experience. The two photos below show the design. Five of these rods were made (1 as a spare), from 6061-T6 Aluminum to fit within .625" OD pistons. The cap bolts are 2-56 and the clamp bolt is 0-80. The .006" wide slot was sawn with a Jewelers circular saw blade given me by Jerry Keiffer. The threaded cross hole was counter drilled, by hand, with a No. 53 drill in a pin vise. A thin piece of brass shim stock was placed in the slot to prevent the clearance drill from going too deep. The wrist pin can never touch the cylinder walls. This eliminates setscrews, pins, pads retaining rings, etc.. The wrist pin should be a light push fir in the piston. 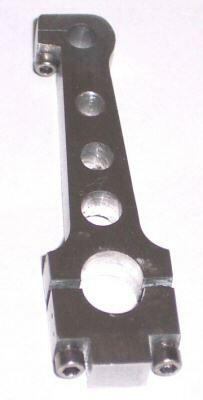 This eliminates pressing the pin in the piston and the use of a drift pin and a hammer to remove the pin. The wrist pin can be removed and reinstalled many times with no damage to the piston or adjacent parts. The bearing surface in the piston is usually greater than the bearing surface in the rod bearing. If the piston gets overly hot, the wrist pin clearance becomes slightly greater. The wrist pin can be solid or tubular. Actually, the time and labor to make a clamp type rod is offset by the time and labor to accommodate a typical tang eye type rod. Compression, or the lack of it, continues to be the most common problem when builders contact me for assistance. This prompts me to post TIP 15 that hopefully will benefit some builders. Compression problems can be on either side of the head gasket, so, let's start on the underside by checking the CYLINDER/PISTON FIT. Remove the head. Place a few drops of fuel on the top of the piston and run it up and down a few times leaving the piston at the top of it's stroke. Remove excess fuel with a napkin. Place your thumb or the heel of you hand over the cylinder and move the piston down. A very strong vacuum should occur against your hand. The length of time that the vacuum exists is an indication of cylinder/piston fit. 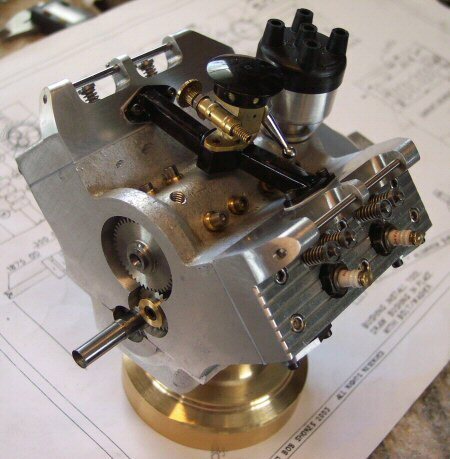 The vacuum will remain for many minutes when the cylinder and piston has been properly lapped to a snug fit. The vacuum will disappear in less than a second if the lapping job or the fit is poor. Good compression cannot be expected with a poor fit. If the vacuum remains strong for 10 seconds, or longer, the fit is acceptable and you can expect the compression to be good. I do not expect the rings to seal the piston until they are "broken in" (with a few hours of running time) and then only when the piston is moving fast. Remember that a "snug" fitting piston will run hot until it has broken in so, run the engine in short burst, for the first hour, to prevent overheating. Certainly, the piston will wear more at the top as this is the hottest area when running. If you are building a slow running (less that 1000 RPM) and a cool running (less than 170 degrees F) engine, a cast iron cylinder and piston is the best choice due to it's coefficient of expansion and natural (carbon) lubricating characteristics. With this setup and a little WD-40 in the fuel to suspend carbon particles, rings are not required for good compression during the first 1000 hours of running time. Above the head gasket. Valves are the most common problem. The valve stem should be lapped and the head should be concentric with the stem for an easy valve grinding job. I use 300 grit compound to grind valves. With a tight fitting rubber tube forced over the end of the stem, twist the valve back and forth with your thumb and forefinger while slowly rotating the valve. DO NOT use a drill or machine to rotate the valve. After the stress of machining, a valve can be expected to warp or bend a bit with temperature variation. Using finer grit will not allow the valve to quickly seat itself if it warps a tiny bit when the engine first runs. ALWAYS use virgin Teflon for head gaskets. It is cheap, readily available, will not "blow", requires no gasket compound, will not stick to metal and will "creep" into surface imperfections. Use brass tubing, sharpened at an inside angle, as core drills to cut bolt holes. Larger core drills (thin wall mild steel cylinders) are easily turned with the lathe. Sparkplug holes should be drilled, tapped and counter sunk (usually with an end cutting end mill) in one operation. The end of the sparkplug should be flush with the inside of the combustion chamber. Anything else is poor design. Always be sure the head bolts are short enough to actually clamp the head down. To determine precisely when, or if, a valve closes, remove the sparkplug, place a rubber tube over the exhaust pipe and blow on it. You cant blow through a closed valve. As always, I hope this little TIP is useful or that it serves as an alternate method for some builders. Am I getting to long winded with the TIPS ? 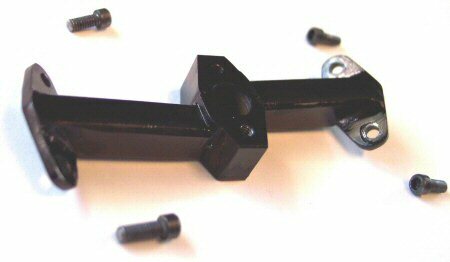 Having built the bridge type inlet manifold for my V-4 engine, I desired to paint it Jet Black, with a high gloss, hard and durable finish. I also desired to do this quickly. The manifold was made of cold rolled steel with stainless steel flanges that are Silver Soldered on, presenting a dissimilar metals problem. The procedure was to finish the surfaces with 400 grit Wet-or-Dry and wash the manifold in Acetone. Using a large Felt Tip Pen, one coat of permanent black ink was applied to all surfaces. The Ink dries in seconds. The manifold was impaled on a rod held in the jaws of a VSR electric drill and rotated slowly while a light coat of Automotive clear lacquer (available at Auto Parts Stores) was sprayed on and it dried to the touch in 3 minutes. The manifold was then suspended over a temperature controlled Hot Plate at 130 Degrees for 20 minutes. The result was a very black, hi gloss, hard, durable finish. I intend to apply two more coats of clear lacquer in a week. The entire process, from surface prep to bolting the manifold on the engine required less than 1 hour of time. To distinguish this process from others, I call it Bob's INKPLATE process. INKPLATE seems to work well on Brass, Aluminum, Silver Solder, Stainless, or a combination of these metals. I have not had time to experiment with other methods of treating the metal, such as abrasive grit size, sandblasting, buffing compounds, etching, etc.. Also, I have not tried other colors of ink such as Yellow, Blue, Green or iridescent colors. INKPLATE seems to be a neat way to put a good paint job on very small parts. If you try the INKPLATE process, or experiment with it, give me some feedback on your procedure/results on the Message Board. Difficult to believe that I have not posted a tip about my Tap Disk. Every shop should have one , and use it, to prevent small tap breakage. I have not broken a tap within the past 10 years while using my Tap Disk and I constantly use tap sizes 0 through 6. Take a few minutes to make one, try it and I am sure you will opt for this taping method whenever possible. Turn an Aluminum disk, 1 1/8" OD, knurl it, center drill .144" and part it off .325" thick. Drill NO. 43 from the OD to the ID and tap 4-40. Install a 4-40, hex head bolt, .750" long. Insert the tap in the Tap Disk to it's mid point. Tighten the bolt with a 1/4" wrench. Drill the hole to be taped in the Drill Press, Mill or Lathe. Remove the drill, fill the hole with WD-40, or your favorite taping fluid and grip the upper half of the tap in the chuck, just loose enough to turn freely. Lower the spindle/tap to the work. Use your thumb and forefinger to tap the hole. The photo below shows the Tap Disk ready to use. 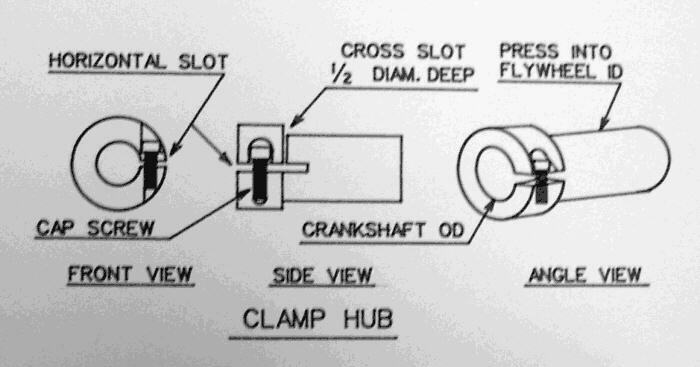 WHENEVER POSSIBLE, USE A SPLIT HUB CLAMP TO MOUNT YOUR FLYWHEEL AS IT ELIMINATES KEYWAYS, KEYS, SETSCREWS, PINS, WHEEL PULLERS, HAMMERS, DAMAGE TO THE CRANKSHAFT AND CUSS WORDS. THE PHOTO BELOW SHOULD CONVEY THE DESIGN BETTER THAN WORDS. INSERT A SHIM IN THE CROSS SLOT BEFORE DRAWING THE HUB INTO THE FLYWHEEL WITH A BOLT, NUT AND WASHERS TO PREVENT BENDING THE HUB. VERY LITTLE TORQUE IS REQUIRED ON THE BOLT TO REALLY GRIP THE CRANKSHAFT. WHEN INSTALLING BOLTS OR SCREWS, PRESS DOWN LIGHTLY AND TURN IT COUNTERCLOCKWISE UNTIL YOU FEEL IT "CLICK" THEN, TURN IT CLOCKWISE. THIS WILL PROPERLY ENGAGE THE THREADS. IF YOU MAKE A HABIT OF THIS, A CROSS THREAD ACCIDENT IS REMOTE. 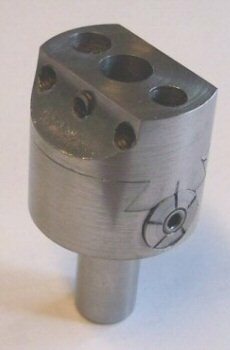 I COULD NOT USE THE 2" CRITERION BORING HEAD (I HAD PURCHASED FOR $100.00) IN MY BARKER BENCH MILL AS IT IS TOO LARGE AND TOO LONG. I BUILT MYSELF A NICE BORING HEAD BY SCALING THE CRITERION DOWN TO 1.35" OD WITH A SHORT 1/2" SHANK. IT ACCEPTS 3/8", 5/16", AND 1/4" BORING BARS. IF I MADE ANOTHER, IT WOULD ACCEPT 1/2" AND 1/4" BORING BARS ONLY. THE ADJUSTMENT BOLT IS THREADED 1/4-40 SO THAT ONE TURN MOVES THE BAR .025". THE RESULT IS AN EXCELLENT BORING HEAD FOR SMALL MILLS. I MADE IT FROM MILD STEEL BUT WOULD USE 303 STAINLESS IF I MADE ANOTHER. IF YOU HAVE A SMALL MILL, IT IS WELL WORTH THE TIME TO MAKE THIS BORING HEAD AS IT IS A NICE CONSTRUCTION PROJECT. 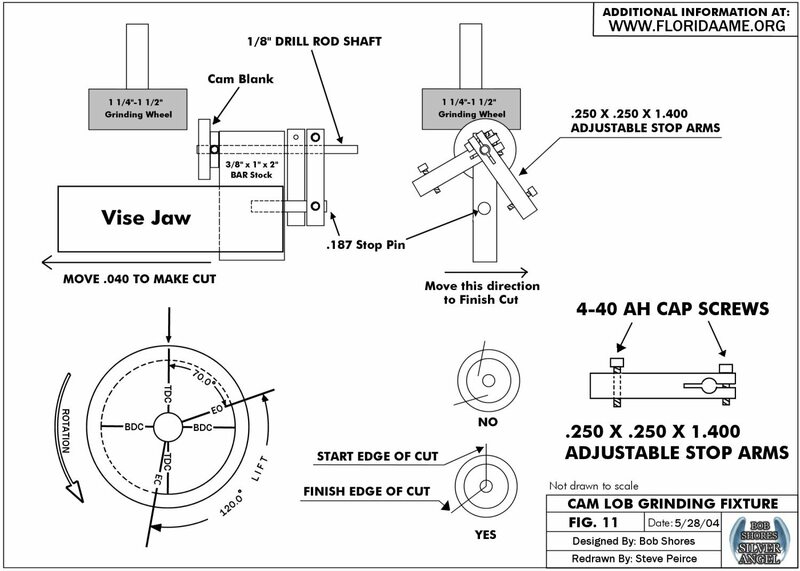 The cam grinding fixture for the Silver Angel has been a topic of recent discussion. It appears older versions of the plans included the fixture and newer (black and white) versions are missing this detail. There is a thread in Construction Questions about this fixture. Steve Peirce got Margaret's permission to draw and post the drawing. Copyright 2004, Florida Association of Model Engineers, All rights reserved.